’Round Christmastime, things are a little different on the Emerald Isle. Instead of logs thrown onto the fire, we find turf blazing bright. Instead of cold eggnog spiced just right, the mother and father are enjoying their stout. You’ll find no Donner or Cupid or Blitzen, but Ould Neddy the donkey and his small cart. Father Christmas with his Irish eyes twinkling ushers in his seven elves, to enjoy the poteen and plum pudding and unpack his large sack. And thus begins the wondrous Irish Night Before Christmas. 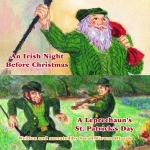 This humorous tale in the same vein as the famous Cajun Night Before Christmas® is the Irish version of Father Christmas’s yearly visit. Told in delightful brogue, it will have everyone wishing “Nollaig sona agut!” (Merry Christmas to you!). Sarah Kirwan Blazek was born in County Wexford, Ireland, and retains dual citizenship in Ireland and the U.S. She currently teaches at Sacred Heart Academy and makes her home in Chicago, Illinois. 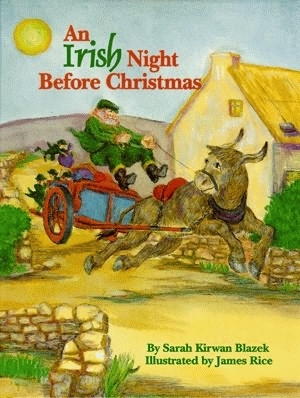 James Rice (1934-2004) produced sixty books, including the illustrations for Pelican’s treasured The Night Before Christmas Series. Mr. Rice’s first book, the well-loved classic Cajun Night Before Christmas®, has more than 750,000 copies in print. With over 1.5 million copies of his books in print, Mr. Rice ranks among the nation’s best-selling creators of children’s books, receiving awards from Printer Industries of America and the Children’s Book Council.